With the level of discourse in the U.S. at a decidedly low point, Kind Snacks is taking its brand name to heart with a storytelling campaign that aims to unite the country by highlighting acts of kindness. "Through the launch of our More Than Nice campaign, we wanted to spark a conversation about the difference between being nice and being ‘kind,’" says Drew Nannis, head of integrated communications at Kind. "In our eyes, there is an oft overlooked distinction that has tangible implications on how we act toward one another." Emmanuel Lubezki, a three-time Academy Award-winning cinematographer (Birdman, Gravity, and The Revenant), directed the latest release, published in December, with Chris Wilcha serving as co-director. Lubezki also happens to be a cousin of Daniel Lubetzky, CEO and founder of Kind. 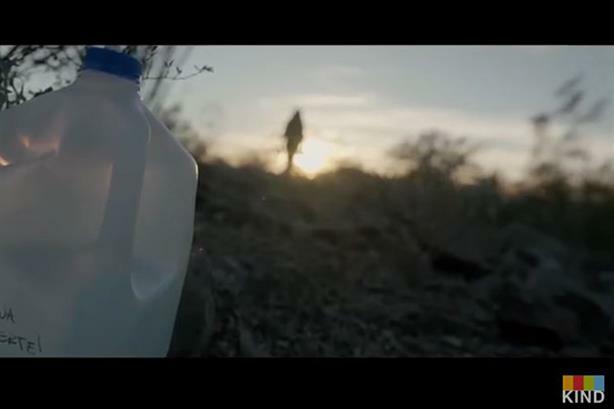 The video visually captures Emmanuel’s personal interpretation of kindness through the eyes of volunteers – members of the group No More Death – who leave jugs of water across the U.S.-Mexico border. As of early February, the video generated more than 1 million YouTube views. Kind’s goal is to move beyond the political and focus on the humanitarian efforts portrayed. "In the video, we see the human element – something that often gets lost in issues that can be polarizing," notes Nannis. " It’s a way – to quote Mr. Lubezki – ‘that transcends politics and reminds us all of the fragility of the human body and the invincibility of the human spirit.’"
Emmanuel Lubezki and Daniel Lubetzky are Mexican-Jewish immigrants. The video has particular significance for them. Another video in the series, A Firefighter’s Inspiring Story of Kindness, profiles a firefighter and Iraq War veteran who volunteers at a kids’ camp for burn victims. Released in October 2017, the video generated almost 380,000 YouTube views. "In looking at the current state of affairs – not just political, but of human interaction – it became clear what we all need now to fix our culture is more than nice," explains Nannis. "Nice simply would not be enough. Our intent with this series is to spark a discussion on how being kind is different, and the role kindness can play in addressing some of our current societal challenges." The company’s storytelling series highlights the nice-kind distinction, playing up the following themes in its branded content, including videos, as well as in social media. Nice is polite, but not always what we need to hear. Kind is honest and stands its ground. The videos runs across social media and YouTube, supported with #morekind to encourage people to showcase what kindness means to them. In conjunction with the most recent video, Kind also invited people to share their own take on the difference between nice and kind by submitting a written essay, photo, or video. A panel of judges, comprised of entrepreneurs, creative storytellers, journalists, and activists – including LinkedIn CEO Jeff Weiner, StoryCorps founder David Isay, and Thrive Global founder and CEO Arianna Huffington – is selecting three winners following the contest closing on January 31. Winners, which hadn’t been announced at the time of this posting, receive $25,000 to donate to the charity of their choice, along with cash prizes and photography or videography gear to help support their next creative project. At last count, there were 383 entries to the contest. Perhaps, as Kind hopes, being kind will catch on.